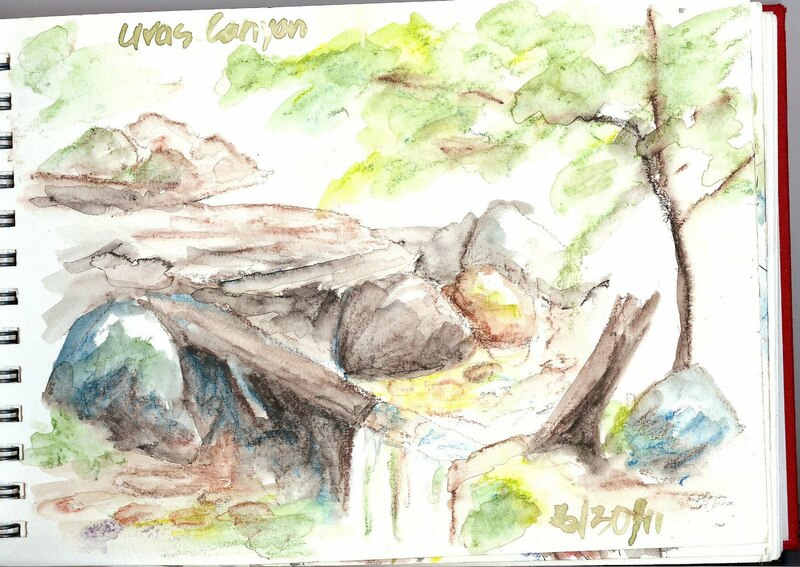 It was a warm day for our Hike & Sketch at Uvas County Park; eight of us showed up. Luckily we were in the shade on a trail alongside a creek, so we didn't mind the heat too much. 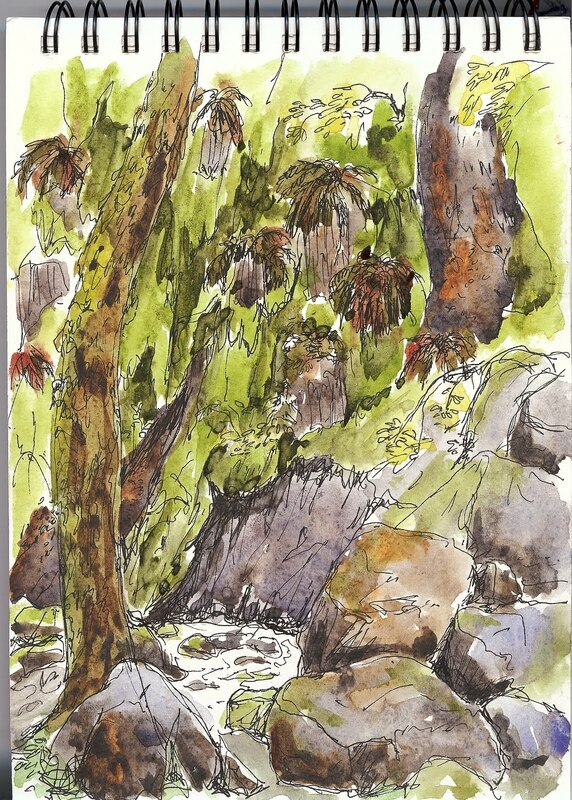 The creek is full of boulders and is edged with rocks and cliffs covered with beautiful very thick soft green moss. There were lots of small rapids and waterfalls. The only downside was the presence of biting mosquitoes. Note to self: buy Off insect repellent wipes before the next trip to the woods! Instead of taking along my trusty travel palette, I experimented with various media; did all of them in a 7"x10" Daler-Rowney Cachet watercolor spiral-bound book. We only had about 20 minutes at each site. For the first piece, I used Lyra watercolor crayons and hit them with a waterbrush. The colors are sort of wimpy, and I only have the 12 piece set, which has an odd assortment of colors. This is the first time I've ever used the crayons. On the next one, I drew with a black pen and added washes after I got home. The paper in the Cachet books is almost as smooth as hot press, so the paint really moves around. On the third page, I did a quick drawing with a black pen, then scribbled the Lyra crayons in and used the watrer brush to blend them. 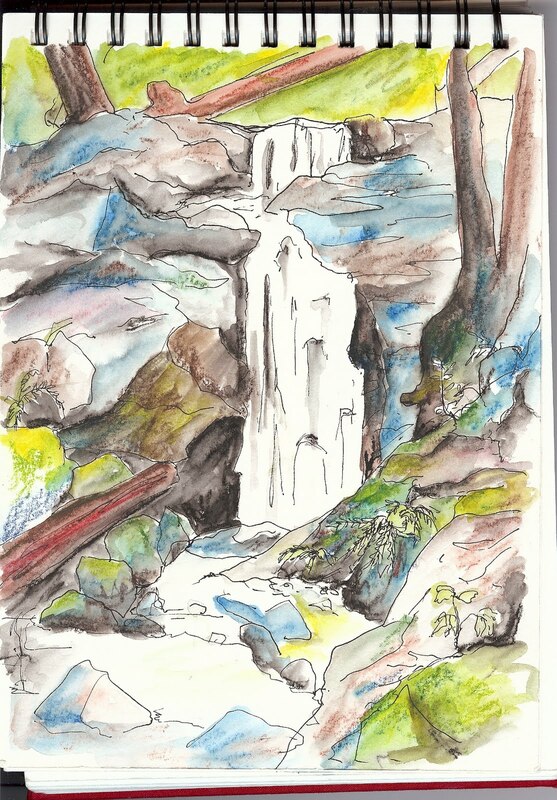 This one works better than the first, as I was a little bolder with the crayon application and the ink sketch helps to pull it together.I think the waterfall effect is pretty effective here. 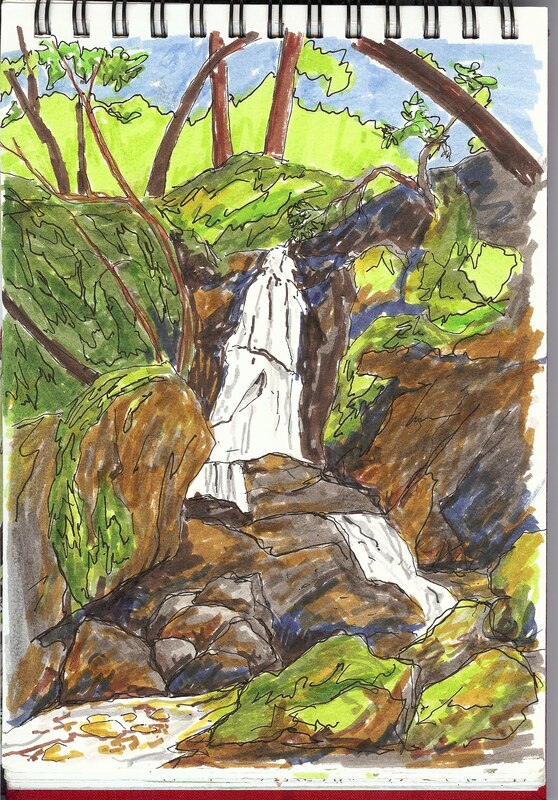 The last one began with a quick sketch in black pen, then I used Faber-Castell Pitt brush pens to fill it in. I only had the small "Landscape" and "Terra" sets with me, so I came home and finished it off with a few more colors.